From conquering sales goals to satisfying customer demands, real estate agents certainly have a high professional standard to live up to. Luckily, ClickUp provides many concrete solutions to meet these needs! ClickUp's Hierarchy structure ensures that all agents have clear direction and purpose in the tasks that they are assigned. While most of ClickUp's features are completely optional, ClickUp's Hierarchy is not. This is because we feel strongly that project management works best when there is a strong unifying structure for guidance. Your Team acts as the overarching container for all of your ClickUp workflows. Create a Team for your real estate agency to manage your entire business in one place. Create a Space called "Real Estate" where you can include information about agents and their potential clients. You can also include other Spaces in your workflow to manage your business, such as "Human Resources", "Marketing", etc. Spaces can also be made private if you need to restrict who has access to view specified information. Add a Project called "Agents" within your Real Estate Space. This Project will act as a folder for your Lists of agents within the company. Dedicate each List within your "Agents" Project to a specific agent. Lists act as "tabs" within their parent Project "folders", so this is a great way to view and manage the individual workflows of employees. Tasks are where you'll be spending the majority of your time in ClickUp, as they represent the concrete action items you'll need to complete to check off Lists and Projects. Add tasks for each property or potential client agents are managing. 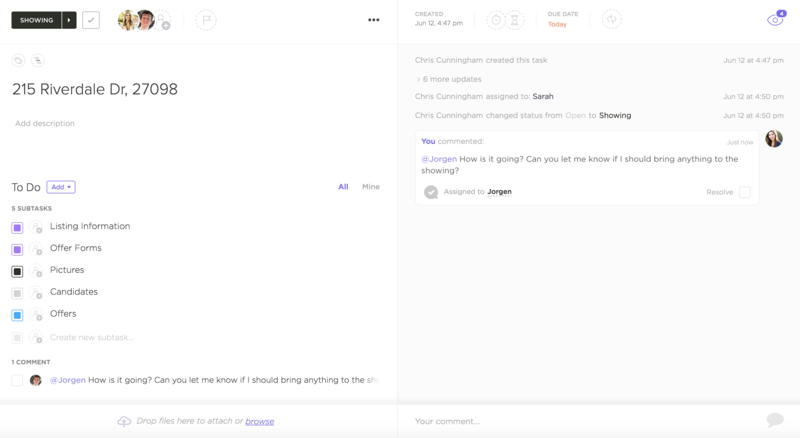 Within each task you'll find tons of customizable features, including assigned comments, custom statuses, and subtasks. These features can be turned on or off at any time depending on what you need to meet your goals! Templates: Once you've developed your hierarchy in a way that works for you, create templates for your favorite Lists and checklists. These will save you a ton of time instead of creating new workflows for each new client or agent that joins your company! Custom Statuses: The sales process can often take unexpected turns, so simple statuses may not always be sufficient for your task workflows. With custom statuses, you can can determine the exact progression that a task will go through on its road to completion. Custom Fields: Add unique task fields to manage property pricing, offers and sales made, and more. Note: Some people like to use custom fields to represent task statuses (as shown above), instead of our actual custom status feature. If you choose to do this, we recommend just using simple statuses in conjunction with your custom fields. Time Estimates: This feature helps you set clear standards and expectations for your team as to when tasks need to be completed. It also enables you to gain insight into whether or not your time expectations for task completion are realistic. Calendar View: As you may know, tasks do not always go as planned! With Calendar View, you can easily drag and drop tasks to reschedule them, as well as set due dates and start dates. Utilize our Google Calendar integration to sync your ClickUp tasks directly with your Google Calendar as well!